The Lucy Burns Institute  (LBI) is a Madison-based 501(c)3 nonprofit organization founded in 2006 and named after a significant leader of the women's suffrage movement. The organization  sponsors three websites: Ballotpedia , which tracks elections and ballot measures at the state level; WikiFOIA , which provides Information on how to use Freedom of information laws at the state and local level; and Judgepedia , which provides information on the nation's judges and court systems. LBI took over  Ballotpedia and Judgepedia from the Chicago-based Sam Adams Alliance (SAM) in 2009 and continues to receive  funding from SAM, as of their most recent IRS filing. SAM is a 501(c)3 public charity that says it is devoted  to pushing "free-market principles." Of its $3.9 million  budget, SAM also provides funding to groups such as the Tea Party Patriots Foundation, the First Freedom Foundation, and the Citizens in Charge Foundation. SAM gets funding from the State Policy Network  (SPN) which is partially funded by The Claude R. Lambe Foundation , a project of Charles Koch who co-owns Koch Industries with his brother David. Graves has also been very involved  with Rachel's Vineyard, a Catholic organization that offers weekend retreats for women who have had abortions, which is intended to reconcile what the ministry calls  "the sin of abortion." O'Keefe is the CEO of SAM. O'Keefe has been featured at events funded by David Koch's Americans for Prosperity  (AFP) group which is heavily involved in supporting right-wing politicians with independent expenditures and other assistance that stretches the limits of legality. O'Keefe is a right-wing political operative that has deep ties to the Koch brothers. He helped launch the American Majority Tea Party group which trains right-wing candidates to run for office. He sits  on the Board of Directors of the Club for Growth Wisconsin, which ran divisive ads in support of Governor Scott Walker's radical overhaul of collective bargaining rights for Wisconsin workers. He has also served on the board of Koch's Institute for Humane Studies, the Center for Competitive Politics, and chairs the Health Care Compact Alliance. On its 2009, 990 form , SAM listed that it "entered into a contract with Lucy Burns Institute (LBI) which provided LBI with sponsorship of Ballotpedia and Judgepedia." 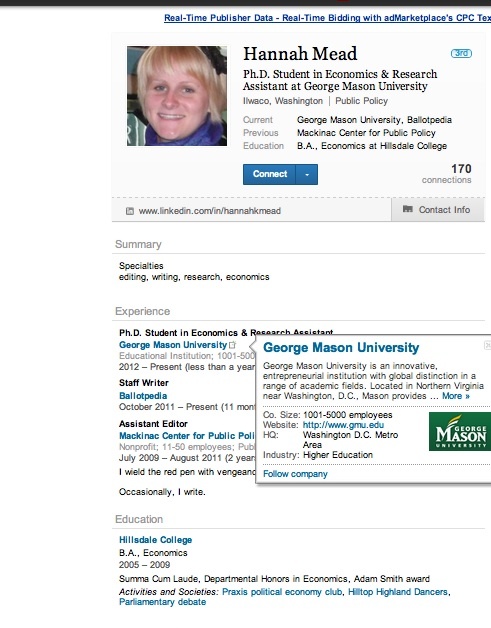 Graves worked  as a part-time consultant to SAM from 2008-2009. LBI also appears to be a family affair, employing two of the Graves/O'Keefe family daughters. Graves, formerly known as Leslie Key, became the Wisconsin chair of the Libertarian Party in 1979 and served  as a regional representative on the Libertarian National Committee until 1983. She likely ran into David Koch as he ran for Vice President on the Libertarian line in 1980. Before her stint in politics, Leslie served as an editor for the Update newsletter, published by the Libertarian Review Foundation. The publication was criticized  in the Libertarian Forum for being "an unofficial organ" disseminating the views of Ed Crane, the founder of the Cato Institute who served as its president until October 2012. A 1981 memo  from Crane to Graves and David Koch illustrates the relationship: "David Koch has indicated he will kick in $10,000 to Update next year. If Leslie is very nice to him we might be able to talk him into $5,000 more (right, David?)." 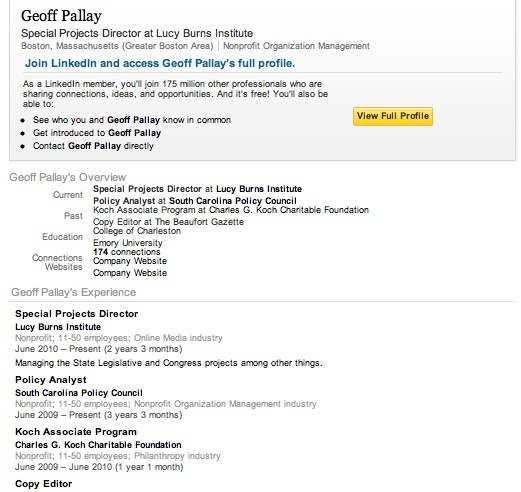 Geoff Pallay , special projects director of Ballotpedia, is a graduate  of the Koch Associate Program, a program of the Charles G. Koch Charitable Foundation. Beyond his time as a Koch associate, Pallay was steeped in the Koch ideology in other positions he held. He worked  as a policy analyst for the South Carolina Policy Council, during which he was "also learning Market-Based-Management -- a management philosophy created by Charles Koch, CEO of Koch Industries." Pallay has been featured at events such as a policy forum  earlier this year at the Cato Institute (along with Eric O'Keefe). Christopher Bedford , an associate editor at the right-wing news outlet The Daily Caller, is a former staff writer  for LBI and Koch associate for the Charles G. Koch Charitable Foundation. 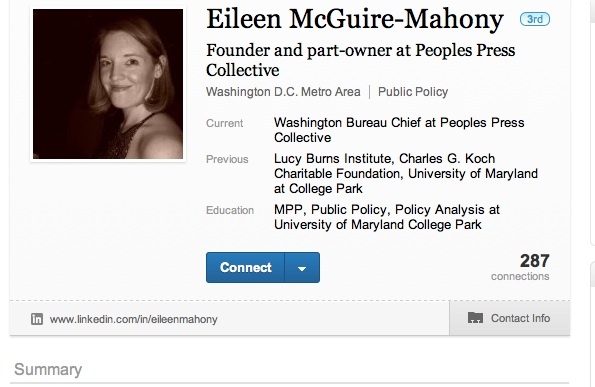 Eileen McGuire-Mahony , a former Ballotpedia Staff Writer, was also a Koch associate . 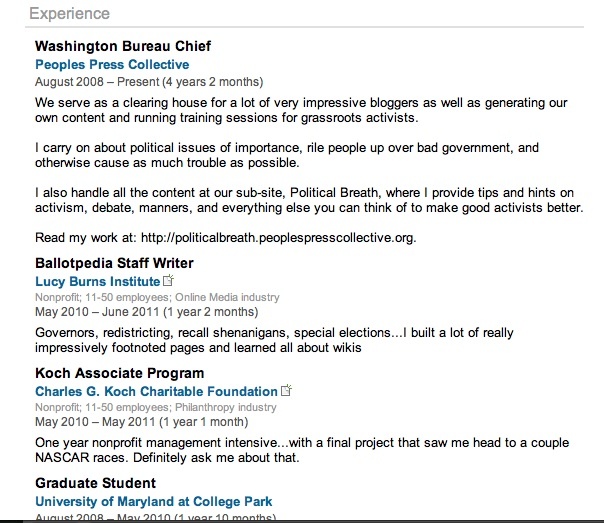 Hannah Mead , listed as a staff writer for Ballotpedia on her LinkedIn page, was also an IHS Koch Summer Fellow . LBI's board of directors also includes right-wing and Koch ties. LBI's secretary, Jack McHugh, is a senior legislative analyst  for the Mackinac Center for Public Policy. The Mackinac Center is a right-wing think tank, which has received some funding from the Kochs and is also a member  of the American Legislative Exchange Council  (ALEC). As previously reported  by the Center for Media and Democracy (CMD), the Mackinac Center has been using ALEC to push efforts to weaken unions, including dismantling public sector collective bargaining rights. Erick Erickson, the Chairman of the Board and Managing Editor of Redstate, is a board member of LBI. Redstate is the "leading conservative news blog for right of center online activists." Breitbart TV describes  Erickson as a "right wing hero." In years past, Lorri Pickens  has served  as the secretary/treasurer of LBI. 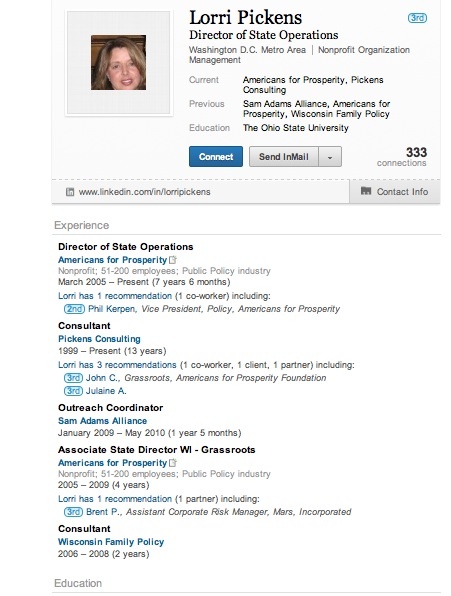 Pickens currently works as the Director of State Operations for David Koch's AFP and previously served as outreach coordinator for SAM. While LBI states that it is dedicated to transparency, it does not list any Board members nor any information about its funding on its website. 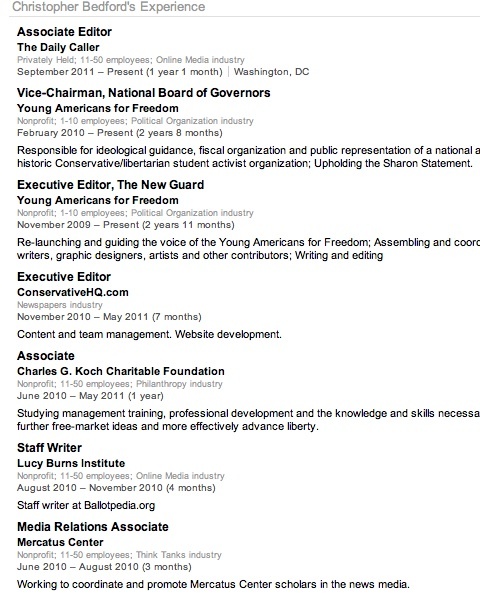 The staff profiles that are listed on the website do not mention the Koch connections, but do include details about half marathons, pet dogs, and home renovations. Graves' profile  is notably bare. LBI and SAM have both provided funding to the Sunshine Review, a 501(c)3 non-profit  organization "dedicated to state and local government transparency." In 2010, it received over  $560,000 from SAM. LBI works in collaboration  with the Sunshine Review on the WikiFOIA project and the Sunshine Review's logo is listed prominently on the homepage of LBI. The organization was founded in July 2008 as a project of SAM, but separated from SAM in 2010. According to LBI's 990 forms, the institute has given the Sunshine Review $231,458 from 2008-2010. According to the group's most recently available 990 form, Graves is a chair of Sunshine Review. The Sunshine Review is listed as a partner organization  of the Charles G. Koch Charitable Foundation for its associate program. LBI has been listed  in the past as a Koch partner organization. The Sunshine Review is an ALEC Private Sector Member. Michael Barnhart, the president of the organization, represents the Sunshine Review on ALEC's Tax and Fiscal Policy Task Force. At the ALEC 2010 meeting in San Diego, Barnhart discussed proposed model legislation : "The Transparency and Government Accountability Act." It was adopted by the Tax and Fiscal Policy Task Force in August 2010, and approved  by the ALEC Board of Directors in September 2010. Similar versions of this bill have been introduced in states such as Virginia , New Mexico , Iowa , and Utah . The bill requires the development of a detailed website listing all revenue and expenditures of the state down to the level of each check. It also includes voting record information, open records information, information on lobbying and state contracts, and ethics information. While the idea seems unobjectionable, the detailed budgeting information has been criticized as a duplicative effort to showcase and make hay of perceived "wasteful spending." The Sunshine Review also gives states a "Transparency Report Card" grading them at the level of state, county, city, and school district. The organization has evaluated over 6,000 government websites. The Sunshine Review has worked  closely with the National Taxpayers Union, another ALEC member dedicated to eliminating taxes and shrinking the size of government. NTU President Duane Parde  is former Executive Director of ALEC. The group has been involved in pushing  this type of transparency legislation in states across the country, even before it was adopted by ALEC. LBI also has relationships with several other ALEC members. It is a member  of the State Policy Network (SPN), which connects and funds conservative state-based think tanks and receives partial funding from The Claude R. Lambe Foundation. SPN is an ALEC member  and "Chairman" level sponsor of its 2011 Annual Meeting, and many of its affiliated think tanks are ALEC members as well. LBI offers  free wiki training seminars to SPN members and Graves and LBI have been featured  at SPN events. LBI also collaborates with other SPN members and ALEC funders, such as the Franklin Center for Government and Public Integrity, a national journalism organization launched by SAM. The Franklin Center has a presence in over 40 states with state-house news bureaus and journalists hosted by other outlets and think tanks. It provides its coverage free as a wire-like service and boasts that it "already provides 10 percent of all daily reporting from state capitals nationwide." As previously reported  by CMD, despite their non-partisan description, many of these websites have received criticism for their right-wing bias. Ballotpedia has hosted a series  of webinars  on elections with the Franklin Center. According to the Franklin Center's 2009 990 report , it gave $43,000 to LBI that year. Since transparency and citizen participation is part of the LBI mission, it is notable that there is no information about how LBI is funded on any of its many websites. The website for the Sunshine Review, which also sponsors WikiFoia, reads : "Sunshine Review is funded largely by grants and a number of private donations. Our organization believes there is a difference between government transparency and personal privacy and for this reason we do not disclose our donors." Perhaps Graves and O'Keefe share that philosophy.